Scott McKenna was recalled to Scotland's starting line-up. 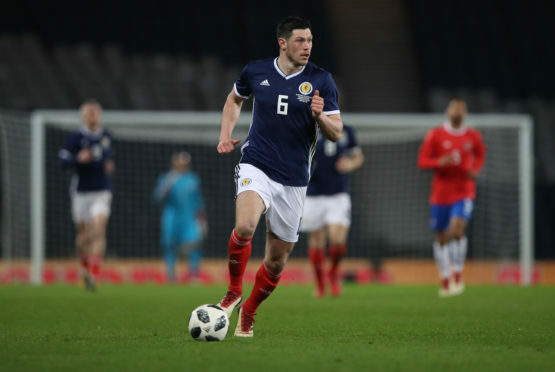 Aberdeen defender Scott McKenna has been recalled to the Scottish national team for the international matches against Israel and Portugal next week. McKenna missed last month’s double-header against Belgium and Albania due to a hamstring tear but has been included in manager Alex McLeish’s squad for next week’s matches after returning to action with the Dons. Aberdeen captain Graeme Shinnie has kept his place in the squad while former Don Ryan Fraser, now at Bournemouth in the English Premier League, has also been included. The Scots face Iseael in Haifa on Thursday, October 11 in the Uefa Nations League before hosting Portugal at Hampden on Sunday, October 14 in a friendly.